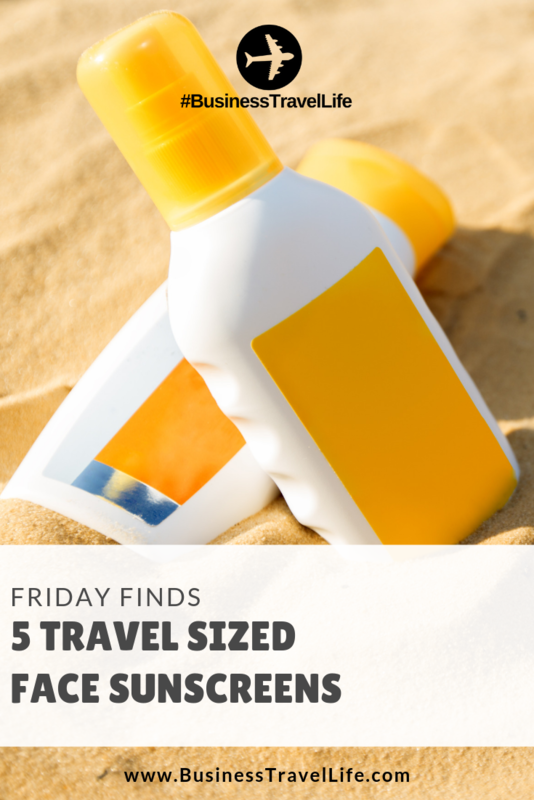 Unless travelers are planning a beach vacation, sunscreen is often an overlooked item on the packing list. The truth is, sunscreen should be worn daily. Even if you spend most of your business travel time indoors, it is impossible to avoid the sun altogether (and you should look for opportunities to get some fresh air). There are many reasons to wear sunscreen daily, including decreased risk of skin cancer, prevention of facial spot and premature again (AKA wrinkles). It is safe to assume you are interested in lowering your risk of wrinkles, facial spots and wrinkles, so we have found some great facial sunscreens for you to try. Most dermatologists recommend SPF 30 for everyday use and 50+ for outdoor use, so your minimum SPF is 30. The sunscreen you choose should be broad-spectrum to block out most of the UVA rays. Make sure you pack enough sunscreen for the duration of your trip. SkinCancer.org recommends applying a dollop the size of a nickel to your face, which I estimate to be about 1/2 of a teaspoon. Ladies, if you wear makeup, remember to apply your sunscreen under your makeup. Look for a lightweight option that will not clog your pores with the addition of makeup. Also, it is advisable to apply your sunscreen at least ten minutes before your makeup, so the sunscreen has time to absorb. 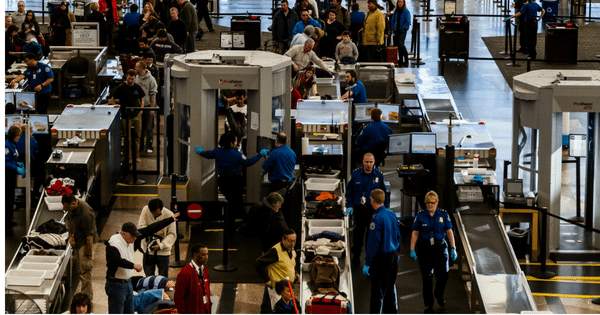 As always, if you plan to carry-on, make sure your sunscreen is TSA compliant. It must be 3.4 oz. 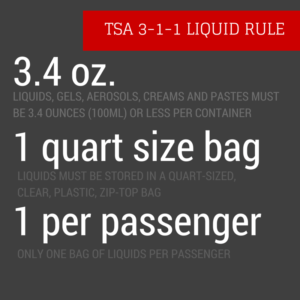 or less and must be packed with your other liquids. Why we love it: SPF 60 is hard to find. This sunscreen also has a sheer finish that eliminates the white residue and makes it easy to blend. Anthelios Ultra Light Face Sunscreen Fluid by La Roche-Posay is formulated with advanced filters and a powerful antioxidant complex. This lightweight fluid blocks out harmful UVA/UVB rays. Water-resistant UVA and UVB protection. Free from fragrance and parabens. Suitable for normal and combination skin types. 1.7 oz, $30 on Net-A-Porter.com. Why we love it: Available in tinted or non-tinted, this facial sunscreen is light but powerful. Clarins’ UV Plus Anit-Pollution Sunscreen features an exclusive Anti-Pollution Complex which shields skin from harmful UVA/UVB rays, pollution, and free radicals. This sunscreen helps protect skin from premature signs of aging and loss of radiance caused by environmental aggressors. It’s sheer, ultra-lightweight texture forms an invisible yet powerful film, making it ideal for application over makeup. The tinted sunscreen is available in Light, Medium, and Deep. 1.7 oz, Tinted $44, Non-Tinted $42 on Macys.com. Why we love it: Proof that high-quality skin care does not have to break your budget. 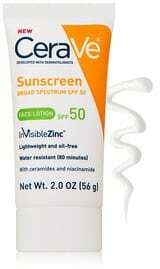 CeraVe Face Lotion SPF 50 absorbs quickly to provide broad spectrum UVA and UVB protection for your skin. Niacinamide promotes the production of essential fatty acids and ceramides to repair and restore the skin barrier. Zinc oxide shields environmental stresses and protects skin. Dermatologist-approved and recommended for all skin types. 2 oz., $14.99 on DermStore.com. Why we love it: Lightweight and seems to absorb quickly. A little goes a long way. Kiehl’s Ultra Facial Moisturizer is a lightweight formula that’s readily absorbed into skin, leaving it soft and nurtured and continuing its effects beneath the surface making it ideal for using any time of day. Broad-spectrum SPF 30 protects against sun damage, which can cause premature aging. Formulated to help restore skin’s natural moisture balance to keep it extra soft and supple. 2.5oz., $21, Nordstrom.com. Why we love it: Goes on easily with a creamy and light texture. Also, it smells great! 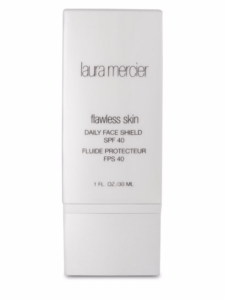 The Laura MercierFlawless Skin Daily Face Shield is an oil-free sunscreen that goes on sheer, with no oily residue, to help shield skin from damaging sunrays and seasonal changes. Daily Face Shield SPF 40 helps to create an invisible shield against damaging UVA and UVB rays, preventing visible signs of aging. This daily sunscreen is formulated with Adaptogen technology which may help the skin adapt to seasonal changes. 1oz, $45 on SaksFifthAvenue.com. What is your favorite travel size facial sunscreen? Comment below!